In the Indonesian Derawan archipelago off the east coast of the island of Borneo (province East Kalimantan), from the end of WWII until the year 2000 nearly all eggs of the green turtle (Chelonia mydas) were exploited for human consumption by professional egg collectors. This resulted in a population decline of more than 91% within the last 50 years. 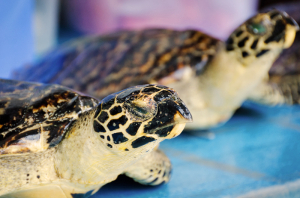 The hawksbill turtles (Eretmochelys imbricata), which also occur in the Derawan Archipelago, are also threatened, because they are hunted for their shell. All species of sea turtles are legally protected in Indonesia now, but enforcement of the regulation is generally weak or absent. Since its founding in the year 2000, the Turtle Foundation has run a protection program for sea turtles in the Derawan archipelago. Currently, the Turtle Foundation operates permanent ranger stations on two important nesting islands of the green turtle, from which the nesting beaches can be continuously monitored. 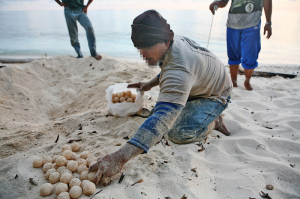 Due to these activities, now about 50% of the nests in the Derawan archipelago are protected against illegal egg poaching. 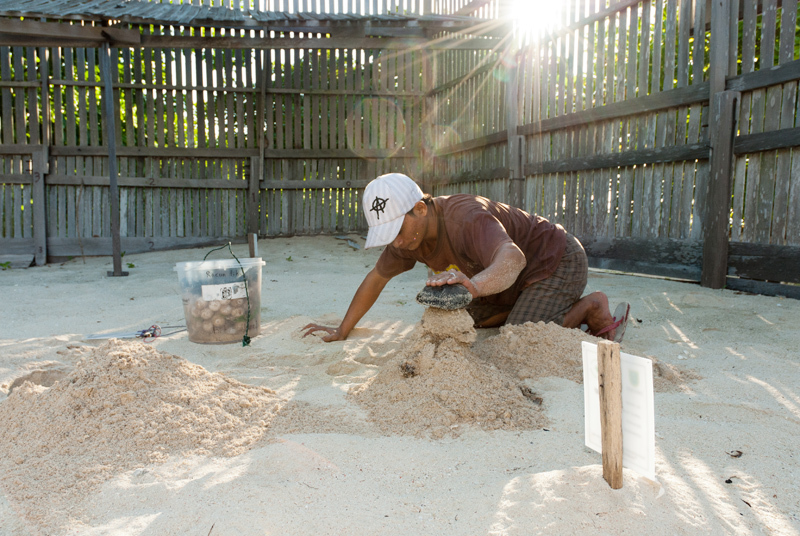 Until recently (as of January 2015) the Turtle Foundation’s efforts enabled a hopeful start into life for about 7.7 million turtle hatchlings. Though this seems like a large number, the estimated survival rate means only about one of a thousand hatchlings will make it into maturity. 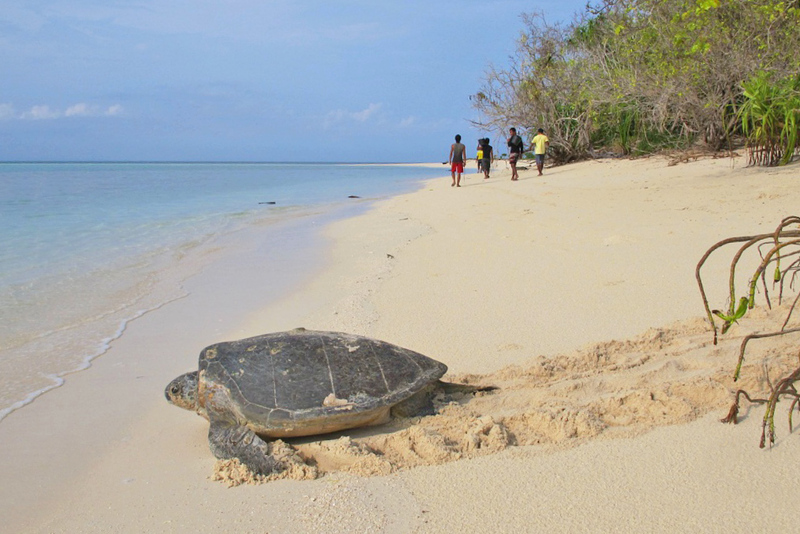 Since it takes more than 30 years for green turtles to reach maturity it will still take a long time until the first turtles that hatched within our protection program return to their island of birth. Thus, protection programs for sea turtles such as ours must be planned and managed on a large time scale in order to ensure sustainable success. 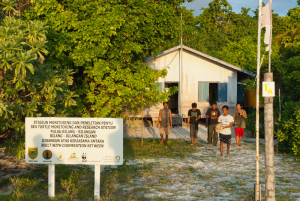 As soon as sufficient funding is secured the Turtle Foundation intends to extend its protection program to two other islands (Belambangan and Sambit) that are unprotected so far. This would increase the rate of protected nests to more than 90%, and would considerably increase the prospective long-term survival of the population. Further, the nearby large coral reef of Muaras could be patrolled via a new ranger station on Belambangan. Thus, the Turtle Foundation would come closer to another of its project goals, which is the protection of all local habitats of the sea turtles, including the feeding grounds in the seagrass meadows and coral reefs, as well as the nesting beaches. This has become more important since a relatively new threat appeared: the massive poaching and looting by foreign fishermen, which can only be countered by increased control of the marine habitats. Here, the Turtle Foundation can provide considerable support to the local authorities by provision of infrastructure (boats and ranger stations on uninhabited islands) and staff. The protection of the marine habitats dnot only contributes to sea turtle protection, but will benefit the conservation of the entire marine biodiversity, on which the local people depend. Because they make their living predominantly from fishing, the sustainable use of natural resources is equivalent to securing the livelihood for the next generations. Therefore, environmental education and public relations are of utmost importance to help the local community to appreciate the complex relationships within marine ecosystems. 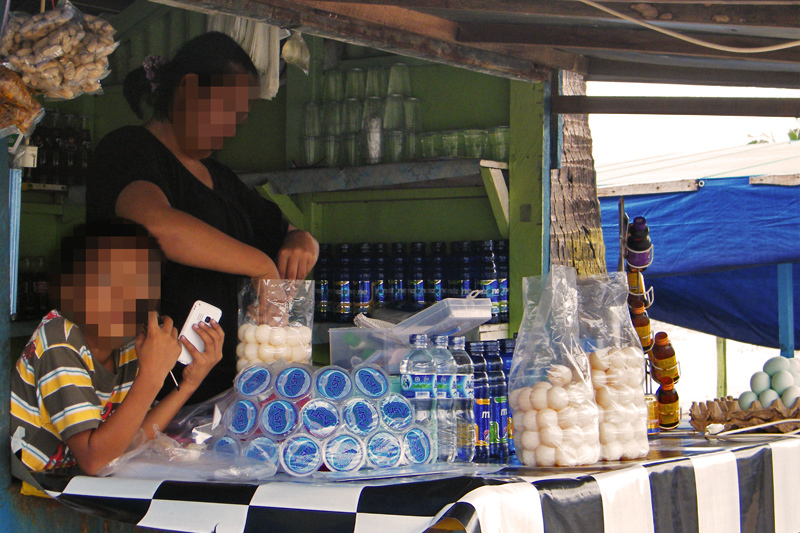 In addition, it is of paramount importance to develop alternative opportunities for income for the local population, including potential ecotourism projects. Finally, the Turtle Foundation recognizes collection and publication of scientific data and insights as an important task to improve the so far scarce knowledge about life and population biology of the sea turtles in the Derawan archipelago. This would offer further possibilities for setting up successful conservation programs.